Part 10 of the music for animals performance series. Leipzig, Germany, a crow colony. 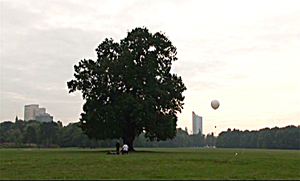 A meeting Point in a park, near the city, some urban signs (Houses) in the background ... A big Tree on the green and on side of this a helium filled Ballon with a size of more than 2 m. Silent hanging near the Tree. Two persons in the early morning light. A cellist and a electronic musician. 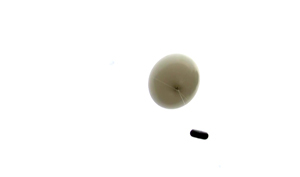 No other persons - only crows are invited to listen to the composition. 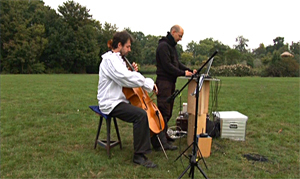 Consisting Fieldrecordings, Cello music and electronic and classical Sounds.